What is USB Certification & Testing? NTS is one of the first labs authorized to perform SuperSpeed USB (aka USB 3.0) compliance testing. USB is the pervasive computer connection standard in world, connecting literally millions of computers to hundreds of millions of peripherals. Since its inception in the mid-nineties, USB has gone on to be the connection standard used on virtually every computer released. NTS performs USB compliance and certification testing as licensed by the USB-IF on virtually every type of USB product. We have been authorized to perform testing of USB 2.0 and 3.0 device and systems/hubs, including SuperSpeed, high-speed, full-speed, and low-speed products. USB hubs, add-in host controller cards, and systems for USB certification and compliance can all be tested by NTS. You can also get your USB On-The-Go (OTG), Embedded Host (EH), and Wireless USB (WUSB) products tested for compliance. We can also perform the testing required for USB 3.0 “SuperSpeed” certification. 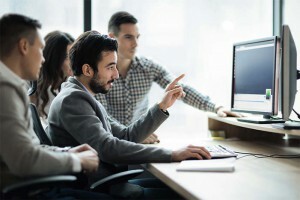 With the vast number of companies developing computers and peripherals, it is important to make sure that your product meets the industry standards. NTS has years of experience testing a wide variety of USB and WUSB peripherals to all of the various USB specifications: USB Compliance (SuperSpeed, High-speed, full-speed and low-speed silicon, peripheral, and system/hub/host controller); USB On-The-Go Compliance Testing (High-speed and full-speed products); and USB Embedded Host Compliance Testing (High-speed and full-speed hosts). NTS has also been authorized to perform Wireless USB Compliance Testing and SuperSpeed device testing. Our testing facilities in U.S., Japan, and Hong Kong can perform testing to make sure your products are compatible with all the various USB specifications. Based on our experience with USB certification testing, we’ve also developed a USB “Golden Suite”to help you evaluate how your USB device functions in the real-world (e.g., with other USB devices and USB chipsets from various manufacturers). Just because your product is USB certified doesn’t necessarily mean it is without issues. We can help you identify those issues before you release your product. In addition, NTS offers the ability for you to attend your USB compliance testing at our facilities. This allows you to address any problems that may occur, allowing your company to quickly and easily make any necessary adjustments to become certified. This also allows you to get a better understanding of the certification process so you can make sure all of your products are successfully pre-tested at your company before they are sent for certification. NTS can also assist with USB driver development and debugging (including electrical such as eye diagram, droop/drop, etc.) to address problematic issues. 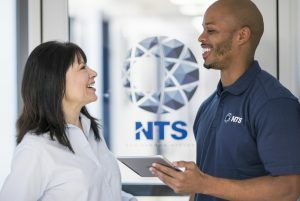 As one of the first certified labs for USB 3.0 “SuperSpeed” device and system/hub certification testing, NTS has the experience needed to help you bring the latest generation of USB products to market. USB SuperSpeed features faster transfer rates up to 5 Gbit/s, more bandwidth, improved bus utilization, and two unidirectional data paths to increase bandwidth, while still maintaining backwards compatibility with USB 2.0 devices. Our test engineers have spent considerable time working at USB plugfests and in our lab to validate the USB 3.0 test specification and have performed numerous tests based on it. NTS is also authorized to perform certification and compliance testing for the Wireless USB (WUSB) protocol. Wireless USB provides a short range wireless connection for USB devices (using WiMedia UltraWide Band [UWB] technology), and includes backwards compatibility with wired USB devices. It functions at 480Mb/s at 3 meters and 100Mb/s at 10 meters. NTS performs testing of Wireless USB products using the same test procedures which have been tested and refined at numerous USB “plugfests” over the past several years. After you’ve successfully completed USB certification testing, you’ll be all ready to get your product certified for Microsoft Windows. We can help you perform WHQL/HCK testing of your product so that you can submit it for the “Compatible with Microsoft Windows” logo. Contact NTS today to get your USB products tested quickly and on your schedule!